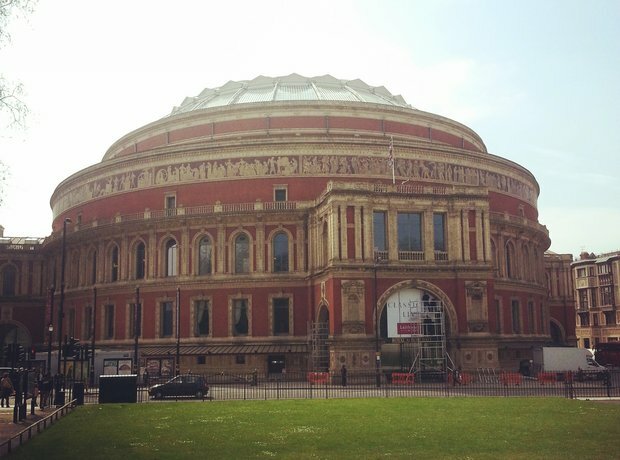 A beautiful day at London's Royal Albert Hall, as Classic FM Live branding takes over the front of the building. The Hall was opened in 1871. The incredible organ at the Royal Albert Hall - so important, it even has its own Twitter account! The instrument has 147 stops and 9,997 speaking pipes in total. Is that the strains of Verdi's Libiamo ne' lieti calici we can hear from Monica, David, Peter and Victoria's dressing room? The dressing room of the man with the golden flute. Classical musicians are a healthy bunch - all the artists have colourful bowls of fruit in their dressing rooms! Miloš Karadaglić is taking a few minutes out of his rehearsal time to chat to us backstage at Classic FM Live. It doesn't just sound great backstage - it looks great too! Members of the Philharmonia Orchestra have arrived! The incredible 'mushroom' discs on the ceiling of the Royal Albert Hall. There are 109 of them in total, and they made their debut at a Berlioz concert on 8 January 1969. Looking dapper (as ever), David and Peter from Amore have arrived at the Royal Albert Hall for a quick rehearsal before heading off for a photo shoot. 10. Classic FM takes over! Classic FM branding is being beamed upwards onto the ceiling, along with branding from the sponsor, Laithwaite's. Luckily, the sun's come out in time for our arrival at the hall - there's quite a buzz about the place! The orchestra will be here later this afternoon, rehearsing on stage at the Royal Albert Hall. The four timpani are covered until the rehearsal starts. The stunning auditorium in the Royal Albert Hall with a maximum capacity of 5,250. Jennifer Pike is in the building! She'll be playing Bruch's Violin Concerto No. 1 this evening. Such a striking building on the northern edge of London's South Kensington. It's mainly made from Fareham Red brick, which accounts for the Hall's regal colouring. The view from the orchestra in the Royal Albert Hall. Is that the gentle strains of clarinet playing we can hear? Tim chats with the guitarist and the accordionist behind the scenes at Classic FM Live. Tim Lihoreau and Jennifer Pike behind the scenes at Classic FM Live. It's all smiles backstage at the Royal Albert Hall ahead of tonight's performance. Sharing the passion behind the classical guitar, Miloš and Tim chat backstage. Cheers! Amore sip a glass of bubbly before their performance. Sir James shows off the inscription on his famous golden flute. The two Classic FM presenters share a chat before Margherita presents the main event on stage tonight. Giving us a little snippet of a performance ahead of this evening's surprise, Amore sing backstage at Classic FM Live. A real treat - Sir James plays backstage during his interview with Tim Lihoreau. Morning presenters Tim and John catch up behind the scenes before John presents on stage. Saxophonist Amy Dickson treats us to a tune backstage at Classic FM Live.